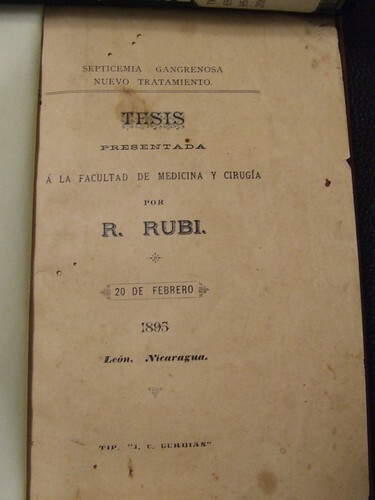 I have scanned the first few pages and posted them on my collection of photos and images about Rosendo Rubi, accessible here starting with the first page. 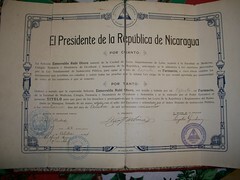 He also has the national medal my grandfather received as Nicaragua’s Best University Professor in 1963. This medal was granted by the President of the Republic, on National Week (mid September, Semana de la Patria). Eventually I intend to write a post about my grandfather. 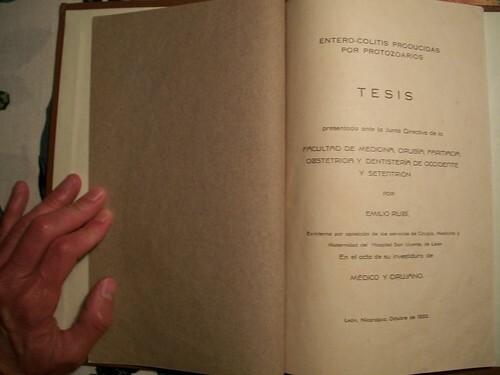 Finally, when I visited my aunt Wilma Nauman in California last December, she showed me the Pharmacy Expert diploma her mother (Esmeralda Rubi Otero, later Esmeralda Rubi Kaffke) received in October 1924 from the University of Leon (Facultad de Medicina, Cirugía, Farmacia y Dentistería de Occidente y Setentrión de la República). It is remarkable that a woman would reach that level of professional training in Nicaragua in 1924, and a tribute both to her own efforts and to her father’s progressive vision. This entry was posted in Rosendo Rubi and tagged Emilio Rubi Otero, Esmeralda Rubi Otero, Leon, Nicaragua, Rosendo Rubi, Universidad de Leon. Bookmark the permalink. Thank you so much for posting this diploma of my grandmother, Esmeralda – I am seeing it for the first time, today on my birthday, and now thanks to your sharing such treasure, a happy day for me!! Ken: Thanks for taking the time to leave a message. I’m so glad you found these documents and photos, and enjoyed seeing them. I translated your grandmother’s diploma for your cousin Christine six months ago; since you left your email address here, I’ll sent it to you via email.